On November 8, 2016, a young, hijab-wearing mother-of-three named Ilhan Omar made history, becoming the first Somali Muslim woman to be elected to state office in America. She was hailed by the New York Times as, “one of the bright lights in the post-election darkness,” and the documentary film "Time for Ilhan" intimately chronicles her hard-fought campaign for State Representative in Minnesota’s Senate District 60B, home to the nation's largest Somali community. A fresh take on the old story of the American Dream, Time for Ilhan offers an inspiring, stereotype-busting portrait of a rising political star as she begins a bold and powerful political career. On November 8, 2016, a young, hijab-wearing mother-of-three named Ilhan Omar made history, becoming the first Somali Muslim woman to be elected to state office in America. 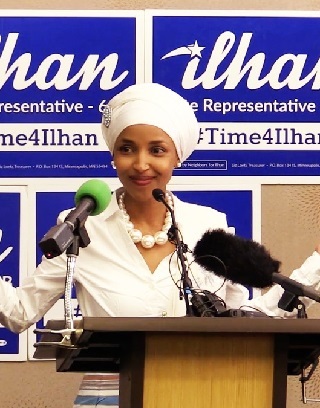 She was hailed by the New York Times as, "one of the bright lights in the post-election darkness," and the documentary film "Time for Ilhan" intimately chronicles her hard-fought campaign for State Representative in Minnesota’s Senate District 60B, home to the nation's largest Somali community. A fresh take on the old story of the American Dream, Time for Ilhan offers an inspiring, stereotype-busting portrait of a rising political star as she begins a bold and powerful political career.